Jock Stein, born in Burnbank, Lanarkshire in 1922, was not only one of the most successful football managers ever produced in Scotland, he achieved it with local talent and not with a large cheque book. He started out as a player with lowly Albion Rovers in Coatbridge and continued to work as a miner during the week, while playing as centre-half on Saturday. He was signed up by Celtic in 1951 as a reserve but injuries incurred by first team players resulted in him being elevated to the first team. His leadership qualities were began to emerge and he became captain and led the team to a League and Scottish Cup double in 1954 - a rare event for the team in those days. An ankle injury later meant that his playing days came to an end prematurely and he took on the job of coaching Celtic's reserves. In 1960 he became manager of Dunfermline at a time when the team needed six consecutive wins to avoid being relegated - and he achieved this impossible task. The following year Dunfermline won the Scottish Cup - the first major trophy in the club's history. In 1964 Stein moved to Hibs and galvanised that team too. In 1965 he was asked to return to Celtic as manager, which he accepted with alacrity. During his spell there from 1965 to 1978, Celtic won the European Championship in Lisbon in 1967 (with a team who were all born within 30 miles of Glasgow), beating the favourites Inter Milan (who had already won the cup twice). Under his leadership, Celtic also won 10 League Championships (nine during his first nine years in charge), 8 Scottish Cups and 6 League Cups. In 1975, Stein was badly injured in a car crash (the other car was driving in the wrong direction on a dual carriageway) and, when he returned, Celtic were not the team they used to be. 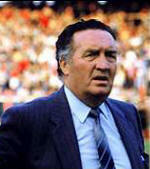 In 1978 he became manager of the Scotland international team. Although the team regained some credibility during his tenure, there were no spectacular successes. But Scotland was stunned when Stein died from a heart attack during an international match in Wales in 1985.